Figure A. RPE conjugated Rat anti Dog CD4 (MCA1038PE) and Mouse IgG2a isotype control (MCA929) labeled with Goat anti Mouse Dylight 649 (STAR117D649). Figure B. RPE conjugated Rat anti Dog CD4 (MCA1038PE) and Mouse anti Dog CD8a (MCA1999S) labeled with Goat anti Mouse Dylight 649 (STAR117D649). All experiments performed on red cell lysed canine blood gated lymphoid cells in the presence of 10% dog serum. Data acquired on the ZE5™ Cell Analyzer. Mouse anti Dog CD8 alpha antibody, clone CA9.JD3 recognizes the canine CD8 alpha chain which is expressed by thymocytes, peripheral T cells in the blood and lymphoid organs . Mouse anti Dog CD8α clone CA9.JD3 has been reported to inhibit cytotoxic T lymphocyte function (Cobbold et al. 1994). CA9.JD3 immunoprecipitates a heterodimer of ~32 kDa and ~36 kDa (reduced) from canine Tumor cells and from thymocytes. Spleen cells from immunised Balb/c mice were fused with cells of the P3X63-Ag.653 myeloma cell line. Moore, P.F. et al. 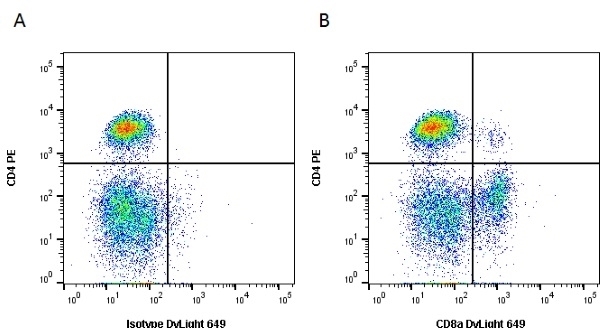 (1992) Monoclonal antibodies specific for canine CD4 and CD8 define functional T-lymphocyte subsets and high-density expression of CD4 by canine neutrophils. Veenhof, E.Z. et al. (2011) Characterisation of T cell phenotypes, cytokines and transcription factors in the skin of dogs with cutaneous adverse food reactions. Vet J. 187 (3): 320-4. Yuasa, K. et al. (2007) Injection of a recombinant AAV serotype 2 into canine skeletal muscles evokes strong immune responses against transgene products. Huyghe, S. et al. (2015) The Microscopic Structure of the Omentum in Healthy Dogs: The Mystery Unravelled. Lin Shiow-Chen et al. (2014) Immune Characterization of Peripheral Blood Mononuclear cells of the Dogs Restored from Innoculation of Canine Transmissible Venereal Tumor Cells. Tai Vet J. 40 (04): 181-90.